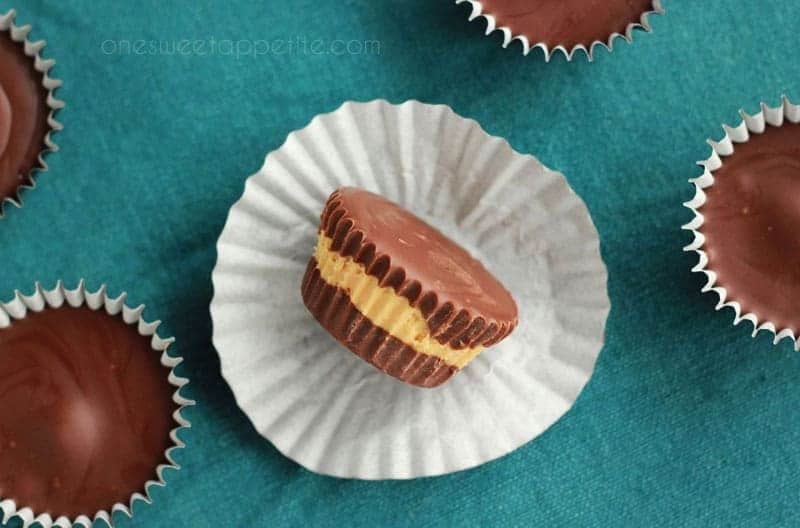 These homemade peanut butter cups are as close to the real thing as you can get! You’ll watch them get gobbled up in no time! Ever since I watched our teacher fumble through the process of recreating the classic candy I have had it on my list of must-make recipes. The chocolate peanut butter combination is so popular and one you have probably seen time and time again on my site. I made this yummy peanut butter chocolate smoothie (not too unhealthy), peanut butter chocolate cookies, and even a 2 ingredient peanut butter chocolate fudge! These candies are surprisingly simple to recreate. You just need a few simple ingredients and your favorite mini cupcake liners. I chose to use black so that the chocolate color would be represented a little more closely but you can get a little crazy and pick any design your heart chooses. These are perfect for any Halloween or holiday party you might be attending. ine two mini muffin tins with paper liners. 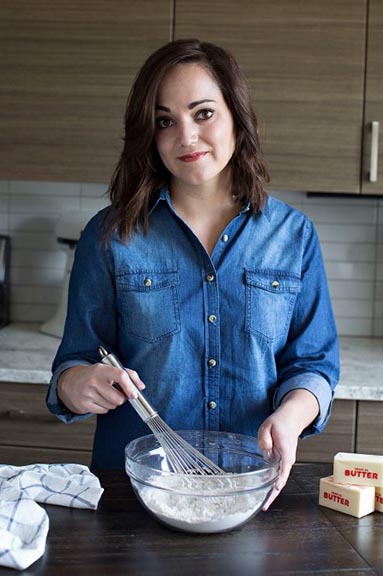 Whisk ½ cup peanut butter with the butter and powdered sugar with the paddle attachment of an electric mixer. Set aside once combined. Melt the two chocolates with the remaining peanut butter in a microwave, stirring every 20 seconds. Spoon 1 teaspoon of melted chocolate into the bottom of each cup. Gently tap the pan to smooth out. Place in the refrigerator while we move on to the next step. Roll the peanut butter mixture into ½ teaspoon sized balls. Pull the pans from the refrigerator and drop one ball into the middle of each cup. Top with 2 teaspoons of chocolate and gently tap the pans to smooth out. These little cups look so cute and addictive. Anything peanut butter and chocolate flavoured is guaranteed to be delicious – so I know these must have been good! You and me both! It was hard to save any for photos. 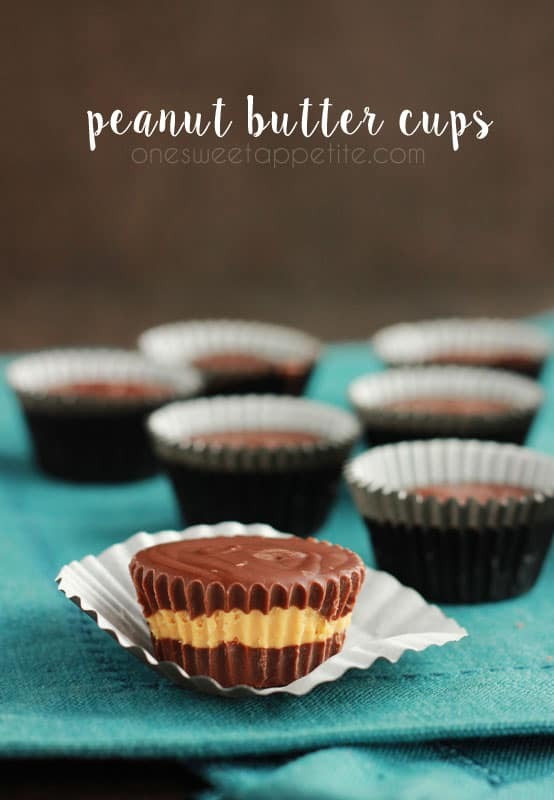 Peanut butter cups are my favorite! Love this homemade version. They look amazing! Thanks Kelly! They are fun and super simple. You’ve just given me the biggest chocolate peanut butter craving! These look incredible. Pinned! Thanks for the pin! I love these. Super simple and made with things you probably have in the pantry. Perfect way to solve that craving!